I can't believe Thanksgiving is ONE WEEK AWAY. 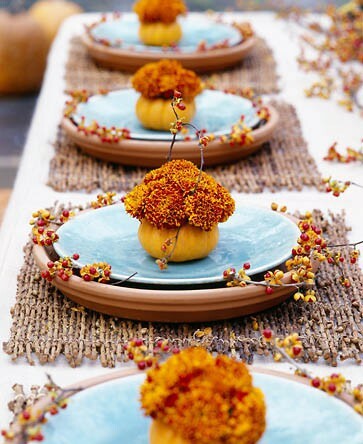 Y'all I have so much I need to be doing...ah, but the evil devil called Pinterest sways me from cooking and cleaning with beautiful ideas for the perfect Thanksgiving tablescape. What a beautiful fall tablescape accented with light blue. I love the individual carnation bloom bunches on each plate too! 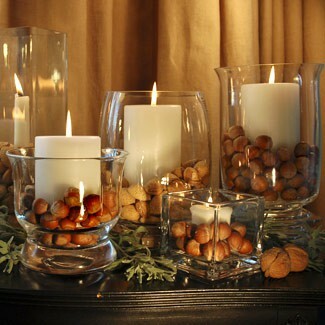 I'm also loving the idea of filling glass vases/jars with natural elements like leaves, acorns, corn, pinecones, etc and a big pillar candle. 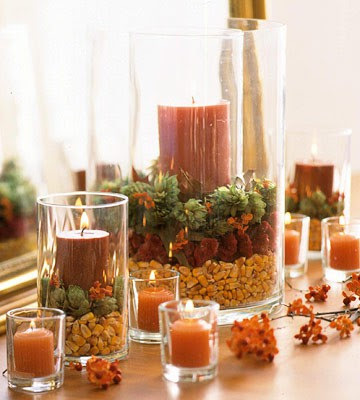 What a classic and beautiful way to bring in the beauty of fall to your Thanksgiving table! I'm linking up with the Inspiration Workshop over at Gussy Sews today for the prompt THANKSGIVING. Also, all next week I'll be doing posts centered around being thankful. I encourage you to stop by and even post on your own blog about what you're thankful for this year. Join me starting Monday for "Be Thankful", a blog post series on A Little of This and That.